Since the very early time of Bagan Art "Buddhist Art" is highly represented. Here are some Bagan art photos. But Bagan architecture is probably what most visitors are interested. 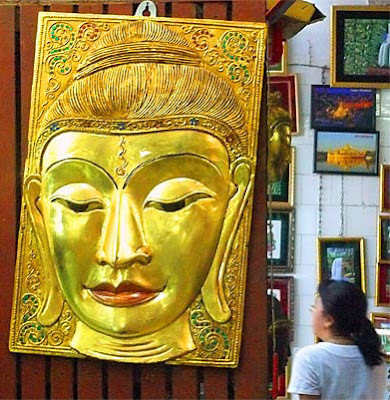 Which is naturally considering the famous pagoda and temples monuments in the old city. Starting the artwork with some similarities to the reliefs of the stone fences the Indian stupas in Bharhut (2nd century BC), Sanchi (1st to 3rd century BC) and Amaravati (1st to 3rd centuries BC) show strong similarities. River is the main reason why travelers are vising Bagan and they are becoming more and more which has a good reason.here are attractive pictures of Bagan People's Life plus Irrawaddy many other unique and interested Buddhism related items views and panoramas are around most sculptures are made from masonry there are jade statues left if you like one visit the Bogyoke market in Yangon there are many on sale with a high level of artwork. All flows into one another and yet acquires its own life forming a whimsical network of imagination and reality. Apart from the decorative function, the ornament also fulfills other tasks. It underscores the architecture of the temple interior, its constructive scheme by emphasizing every essential detail of the architecture - the vaults, the arches over the two entrances to the circulating gallery, and over the central entrance into the temple. It marks and emphasizes every corner of the interior, framing the Buddhas sculpture and the gray Su-jet compositions that decorate the temple wall, meaning "organizing" the distribution of the paintings on the wall surfaces and on the ceiling according to the architecture of the interiors of the building. 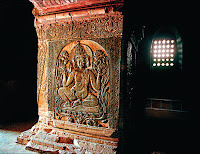 The paintings in the Kubyaukgyi temple at Wegyi in are related to the artistic style, the character and the role of the ornament in the overall system of the picturesque decor the temples of Thambula Lemyethna and Theinmazi, dating from the middle of the 13th century. These creations give a fairly clear idea of the new tendencies in the decorative painting of Bagan at the end of the 12th and beginning of the 13th century. 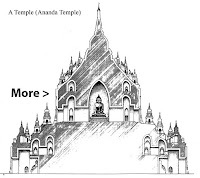 The image and architecture of the Stupa have a high rank in Bagan's artwork since it symbolized one of the four main events in the life of Gautama Buddha namely the Parinirvana the "Path to Nirvana of the Buddha immediately after his death. 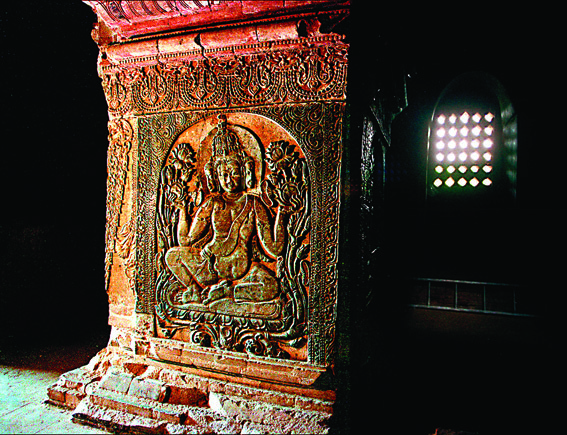 The image of a Stupa. Images and buildings of stupas often symbolizing the death of Buddha the remains of Thayekhetaya Payagyi, Bawbawgyi and Payama, which have survived to the present day have been built in the 6th to 9th centuries and rose above the city walls in the immediate vicinity of the city (Pisseyan), the Kaunglaung, the Kaunglaung, the so-called Kaunglaung, which means "bell". The Payagyi and Payama Stupa are crowned by a screen called the Burmese Hti And the Hti are also the three skin parts of the stupa of later times, as they were built during our whole days in the history of Burmese architecture. They are mostly stupas of great proportions, which reach a height of up to 40 meters and more. The stupas of Thayekhetaya attract particular attention through their form. This differs considerably from the Indian and Sinhala prototypes, which were built before and at the beginning of our time calculation. The famous stupas of San-chi including Karla and Ajanta (India) and the stupas of Anuradhapura (Sri Lanka) with their hemispherical but slightly square shape resemble the long-drawn stupas of Thayekhetaya, Which according to previous knowledge have no analogies in the neighboring countries in no way. The art and architecture of Bagan. The art and architecture of Bagan are an undoubtedly unique phenomenon there is no place in the world so densely populated with hundreds of architectural religious art monuments and building complexes that have also been erected in the relatively short period of about 250 years in the Middle Ages. At the same time, the culture of Bagan remains typical of medieval Buddhist architecture in general. Combining a uniqueness and its unmistakable iconographic characteristics. 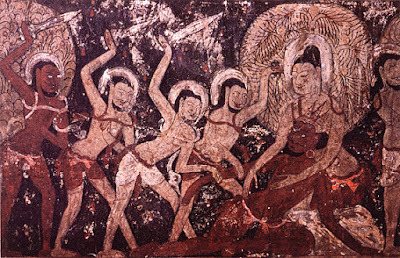 It was deeply conservative and the evolution of the artistic style of Bagan can be traced mainly to subordinate details. The objects of art were among other herons gannets ducks ants deers hares, or long-horned bivalves, owls, peacocks, or fantastic mollusks can be recognized. All flows into one another and yet acquires its own life, forming a whimsical network of imagination and reality. Apart from the decorative function, the ornament also fulfills other tasks. It underscores the architecture of the temple interior, its constructive scheme by emphasizing every essential detail of the architecture - the vaults, the arches over the two entrances to the circulating gallery, and over the central entrance into the temple. The paintings in the Kubyaukgyi temple at Wegyi in are related to the artistic style, the character and the role of the ornament in the overall system of the picturesque decor, the temples of Thambula Lemyethna and Theinmazi, dating from the middle of the 13th century. These creations give a fairly clear idea of the new tendencies in the decorative painting of Bagan at the end of the 12th and beginning of the 13th century. 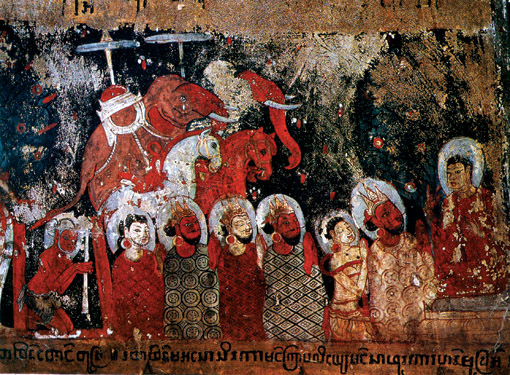 About Bagan wall paintings temples. The ornamental motifs of the wall paintings were so prominent that they determined the overall character and the peculiarity of the picturesque decor. The forms of these ornamental paintings became lighter, more elegant, more complex, and more expressive. Exuberantly rich in figurative details, they testify to the high artistic mastery, the imagination, and the fine understanding of their creators for the laws of decorative art. 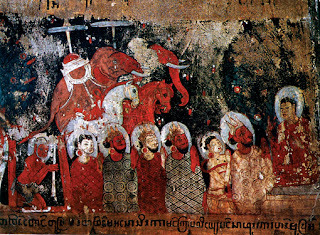 The scenes from the jatakas attained a finished simplicity, the rich characteristic of the Bagan character being voluminous.